The week is slowly but surely coming to an end. And I have a delicious recipe to share with you all before I jump into It's Ok Thursday! This recipe was not originally on my pin board, but after making it Tuesday night I just knew this recipe was going to be a keeper! I mean my dad gave it 2 thumbs up (he has been loving all the new recipes we have been having)! It is a spin off of a good old Beef Stroganoff. 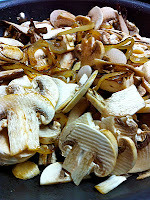 But meaty Portabello mushrooms stand in for the beef. 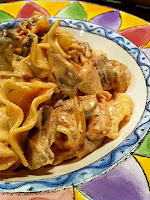 There is an interesting twist to this recipe that makes the sauce creamy! You ready for it? Tofu! But you know what, the tofu works especially when blended with beef broth, spices and tomato paste. Throw the perfectly caramelized onions and mushrooms in the mix and you have a perfectly satisfying meatless dinner! This recipe comes to you from Clean Eating Magazine (I have been finding some of the best recipes on their site). They were the master minds behind the Spanikopita casserole (which I originally saw here)! So head on over and check out the recipe, I promise you will not be disappointed! Click Here! Alright now onto It's Ok Thursday! ...I am counting down the days till Valentines day, because that means I get to see Mark (and celebrate 2 years)! ...I have been looking forward to Friday all week. Not just because it is the weekend but because of the chance to entertain and be with friends! ...I am looking forward to a relaxing lazy Saturday morning. Pancakes anyone? ...after seeing the current temp in Minnesota I googled warmer places to live! I don't get along with negative temps! Happy Thursday Everyone! Whats ok with you today? That actually sounds delicious! I have never cooked with tofu before. Oh my gosh!!! I couldnt live anywhere that reaches a negative lol!! Its 57 here! I caaaaaaaan't wait until Friday. Oh wow.... -6??!! cRAZY. I'll take the beach anyday!! I have been craving a French toast casserole lately, comfort food mmmmm. Happy Thursday! I've been counting down Friday since last weekend!! Haha no harm in that! And -6?! no thank you...couldn't do it! It's getting down to 0 in chicago today.... but I'm not particularly okay with that :) I am excited for Valentine's day too - any excuse for mushy romance and I'm in. That mushroom recipe looks amazing!! Yikes that's cold! And I'm checking out the recipe now! That is TOO cold! It doesn't get thhaaat cold in Ohio! WOW!! -6? I thought I had it bad in Boston!! That's cold! Love your blog! -32 just sounds like no fun! It's ALWAYS okay to look forward to Friday! I do it even if I have to work over the weekend! Does that -6 make you miss the 20s and snow here in Indy? I'd take that beach ANY day! 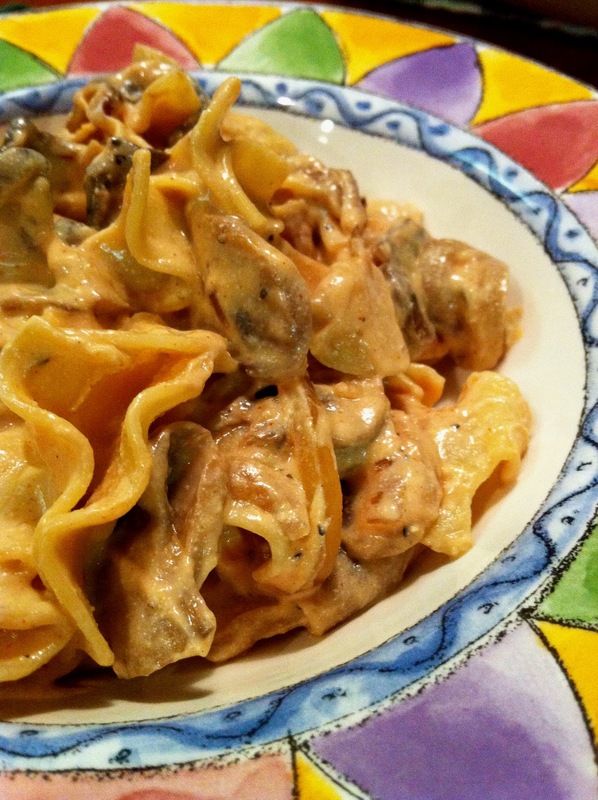 We just had stroganoff this week, too! It's a stroganoff week for everyone! Stay warm! anddddd I'm heading to that clean eating website right now! I'm counting down the days till Valentine's Day too! I've always loved the holiday (even when I was single) and now that I have Bryce, it's even more exciting!